Munchkin is giving away this Ultimate Gift Basket. 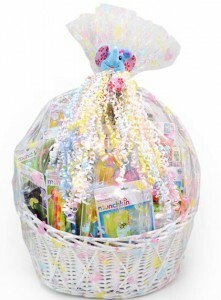 From toys, teethers, feeding accessories and bath products, the Ultimate Munchkin Gift Basket comes beautifully wrapped in a deluxe wicker basket and has over 40 different Munchkin items guaranteed to delight both parents and baby. Here’s your chance to win one! Just click on the blue “Enter Contest” button and fill in the form for your chance to win one of these Free gift baskets valued at $250. Contest closes January 25,2013. One entry per person, per day for the duration of the contest. Good Luck!